Pet Feeder by DougCostlow is licensed under the Creative Commons - Attribution - Share Alike license. This is my auger based pet feeder inspired by the work of Tunell and kitlaan here on Thingiverse. 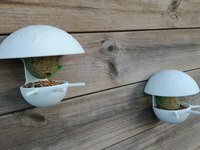 The design centers on using a PVC plumbing tee and printed parts to build an auger screw conveyor that dispenses pet food. The screw is driven by standard hobby servo which can be controlled by your favorite microcontroller. This means anything can control the pet feeder activation, a simple timer, a smart phone, twitter, your own brain waves or even better your pet's brain waves! 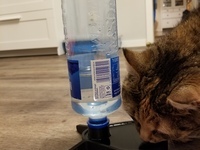 The pet feeder is design to work with a 2â€ PVC plumbing tee, a standard size servo modified for continuous rotation and is assembled using 4-40 machine screws and nuts. I used a plastic pitcher as a hopper which is attached with screws to the funnel, but any suitable replacement could be used. Two stands form the base of the feeder and could be cut from most sheet material on a cnc router or laser cutter. I have included the dxf file for the stands. 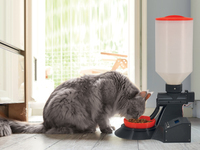 Its up to you to decide how to control the activation on the feeder but I will note that servo cannot just be driven forward each time you would like to dispense pet food, this will result in jams and a stalled servo. I have found that a pattern of first rotating the screw 60degrees backward and then 120degrees forward clears kibble jams. Just repeat this sequence as needed to dispense the required amount of food. The parts were inspired by Tunell and kitlaan but I created my own models for everything with Solidworks. My Solidworks files are in the zipped folder which includes the assembly from the picture. Say thanks by giving DougCostlow a tip and help them continue to share amazing Things with the Thingiverse community. Say thanks and help DougCostlow continue to share amazing Things with the Thingiverse community. You'll need a PayPal account to tip DougCostlow. Click the button below and you will be redirected to PayPal. Once the payment is complete, you'll be brought back to Thingiverse.